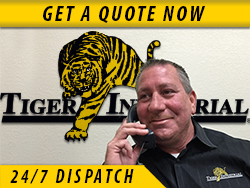 Tiger Industrial Rentals has a large client base in the the oil and gas industry. Whether you have job sites upstream, midstream or downstream -locally or internationally - Tiger has everything you need. Where you need it. When you need it. Tiger's mats are used on construction sites worldwide. From synthetic to wood mats, we provide a firm foundation to any work-site delivering protection for your personnel and equipment. Rain or shine, our mats get the job done right. Have an accident on the job? Tiger has the equipment to clean up, haul off, provide power or setup housing on a work site. From blast resistant buildings and generators to skip pans, rest assured we have what you need, when you need it – all available from one trusted source.